In this industry, it is all too easy to focus only on the high end of the PC market. Manufacturers want to show off their best side, and often provide samples of high-end, high-expense devices more than their other offerings. While these devices are certainly exciting, and can set the bar for how products should perform, there is definitely a gap compared to being able to review the other end of the market. A couple of years ago, HP launched the HP Stream 11, which at the time was a solid entry into a new price bracket, but it was, of course, a device with a lot more compromise than HP’s more expensive offerings. But, HP was not sampling the Stream 11 to very many people, as can be the case on devices like this, so I went ahead and purchased the Stream 11 for review. When Chinese manufacturer Chuwi reached out with an opportunity to take a look at the Chuwi LapBook 14.1, it was a great chance to see how this market has evolved over the last several years, and to see how another manufacturer tackles the inescapable compromise of this end of the market. The Chuwi LapBook 14.1 offers a lot of computer for the money. The price has varied a bit over the last six weeks, but it has been as low as $249.99 USD, and is currently for sale for $264.99. 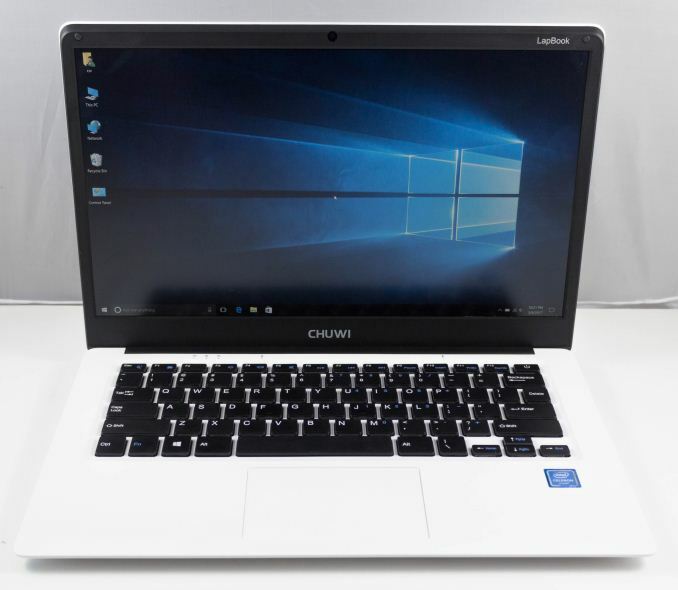 As its name would suggest, the Chuwi LapBook 14.1 is a 14.1-inch laptop, featuring an Intel Celeron N3450 CPU, which is the latest 14 nm Atom cores, codenamed Goldmont, and in this case, it’s a quad-core model which can hit 2.2 GHz in its 6-Watt TDP. We’ll dig into Goldmont more in a bit, but Goldmont in this configuration is known as Apollo Lake, and it features Intel HD Graphics 500 with 12 EUs up to 700 MHz. 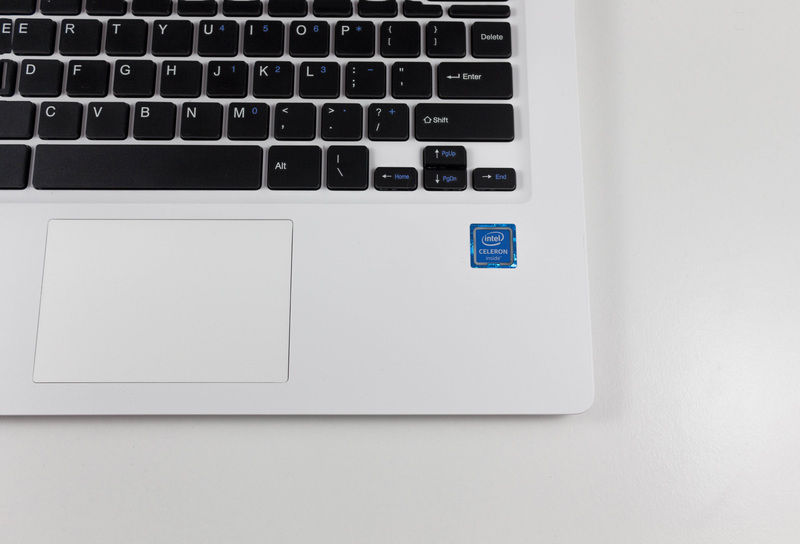 The LapBook also features 4 GB of RAM, and 64 GB of eMMC storage, as well as a MicroSD slot for expansion up to another 128 GB of storage. Where the Chuwi LapBook stands out though is in the display. The LapBook features a 1920x1080 IPS panel, when most laptops in this price range feature 1366x768 TN displays. Most, but not all, with HP offering a Carrizo-L powered 14-inch notebook with IPS as well, so while Chuwi is not alone in this market, the IPS display is a huge step up over the TN competition. The LapBook also features 8 mm bezels, which is quite a bit thinner than most laptops, and especially laptops at the $250-$300 price range. Chuwi has also gone with an 802.11ac wireless card from Intel, which is good to see. It’s a single channel only, but assuming you have an 802.11ac router, it will offer a lot more performance than an 802.11n model. Overall, the Chuwi LapBook packs quite a bit in for just over $250, with 64 GB of storage, 4 GB of RAM, a FHD IPS display, and all in a 9-20mm thick package weighing in at a few pounds. It’s very portable, it has decent specifications, and the price is good, but specifications don’t make a computer, so let’s dig into it a bit more to see how it stacks up.